When Madhumati was launched my father was nowhere close to being in the film industry. 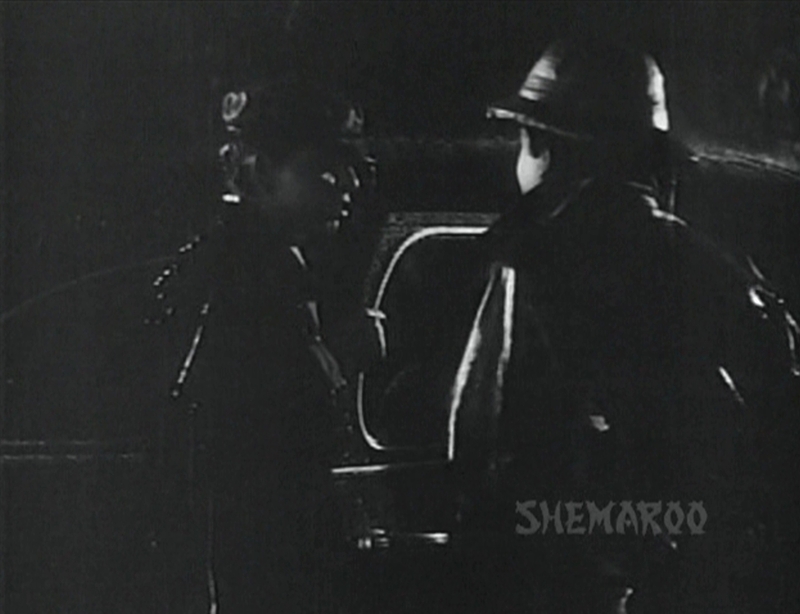 According to what a former assistant of Bimal Roy told me, Madhumati was under production for six years. Bimal Roy had staked almost everything on this film, had the film flopped it would have more or less sounded the death knell for Bimal Productions. Thankfully the film was a huge box-office hit and the entire Bimal Roy Production team heaved a huge sigh of relief, not only that a bonus was also declared. I remember my mum often telling us, " We purchased this (now I do not remember the item) with Madhumati’s bonus". 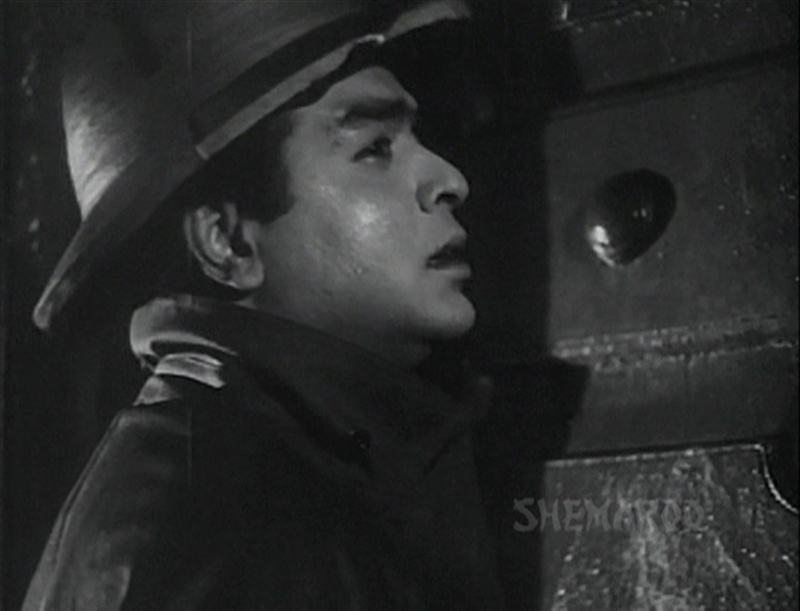 Yes dad too received the bonus, because he too received a salary from Bimal Roy Productions; he was perhaps the only actor then to be employed by a production house. Although technicians were employed, actors had begun freelancing for quite some time. My father had requested Bimal Roy to pay him a salary, as he was a little nervous about exchanging his secure government job for the uncertain world of films. 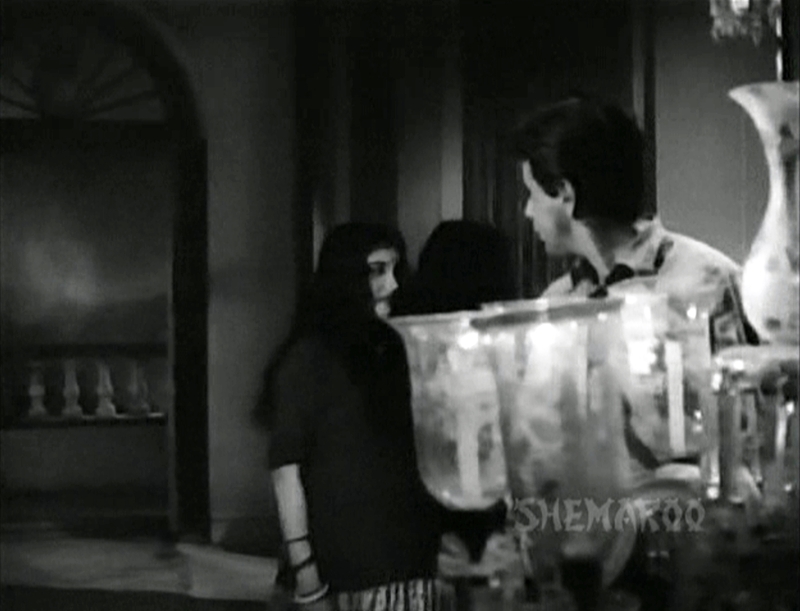 My father was nowhere in the picture when Madhumati was being filmed. 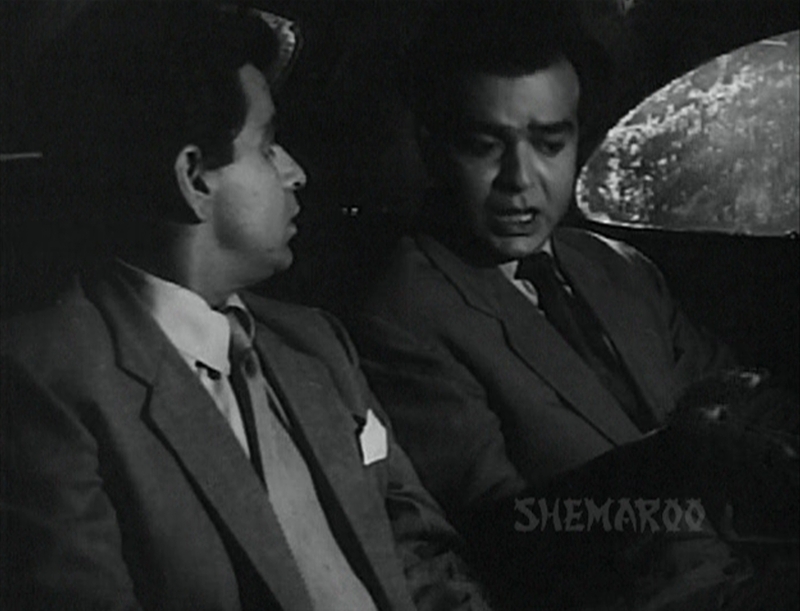 After Bimal Roy had decided to introduce my father, he invited my father to watch the film’s shooting, so that he would get a hang of how a film is made. They were shooting some scenes on location somewhere in the hills near Nagpur. Most of the film was shot on location in North India but some patch work shooting was done near Nagpur. At that time my father had no clue that he would be part of the cast. It was much later, after my father had perhaps already begun shooting for Sujata, that Mr. Roy asked my father to play the role of Dilip Kumar’s friend. When you watch Madhumati what you immediately notice is that the director has handled the subject of re-incarnation with absolute finesse. 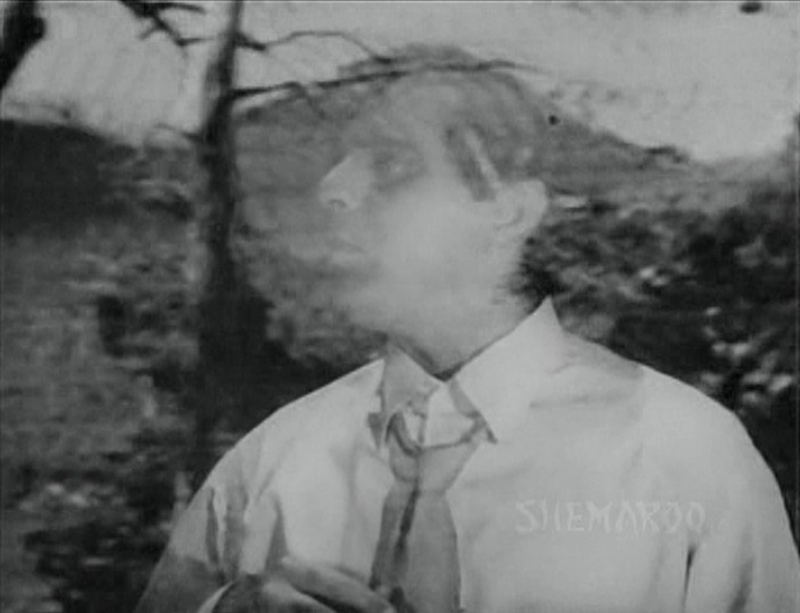 This is a subject which perfectly lends itself to the play of light and shadow and you can see that Bimal Roy, who started his film career as a photographer, is in his element here, getting the best out of his cinematographer Dilip Gupta. In the past directors were not afraid of silence both in India and the west. For quite some years now you find that directors whether here in India or in the west are a little vary of having silent scenes. They either fill it up with jarring background music which reduces the scenes impact or they have some silly song playing in the back ground. If you watch Madhumati you will notice that Roy has judiciously and effectively used silence and music. As I was growing up, I learnt one thing and that is, if any filmmaker wanted his background score to make an impact then he automatically chose Salil Chowdhury for the job. 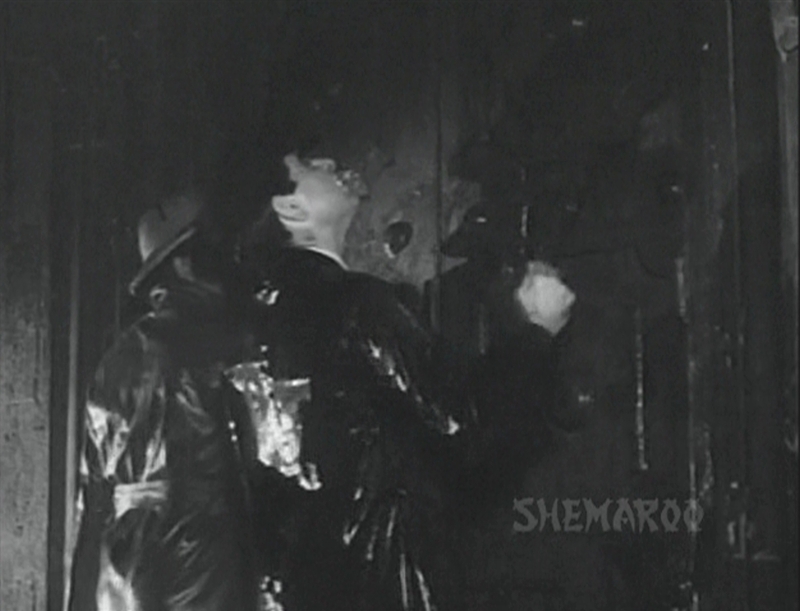 When it came to background music, Salil Chowdhury was considered to be the undisputed king, therefore when it came to B.R.Films Kanoon and Itefaq –films without songs- the Chopra brothers chose Salil Chowdhury to compose the background music for the films. In Madhumati too the background music plays a very important role in creating the right atmosphere for the film. It begins right from the opening scene where Devendra (Dilip Kumar) and his friend the doctor (my father) are on their way to the railway station on a stormy night. Stranded in the rains they are compelled to take shelter at a very old haveli. As you watch the scene you will see how the background music has been sparingly used, most of the time you hear the sound of rain, a play of light and shadow due to the lightning and the creaking sound of the door. That something is about to happen is conveyed subtly when the doctor looks a wee bit confused- there is frown on his face- when he sees Devendra tugging at the rope connected to the doorbell, for the obvious question here is, how did Devendra know that rope was actually connected to the door bell? 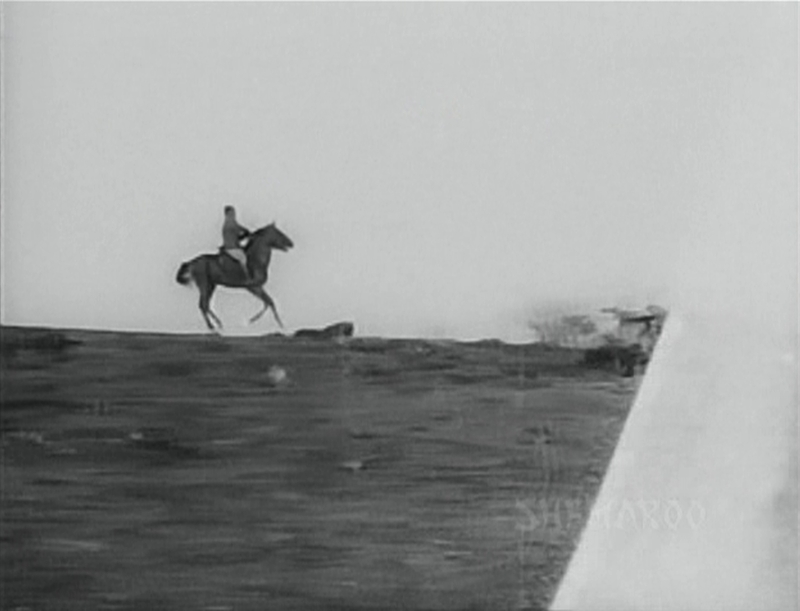 and then the sound of a horse and the image of someone riding a horse. 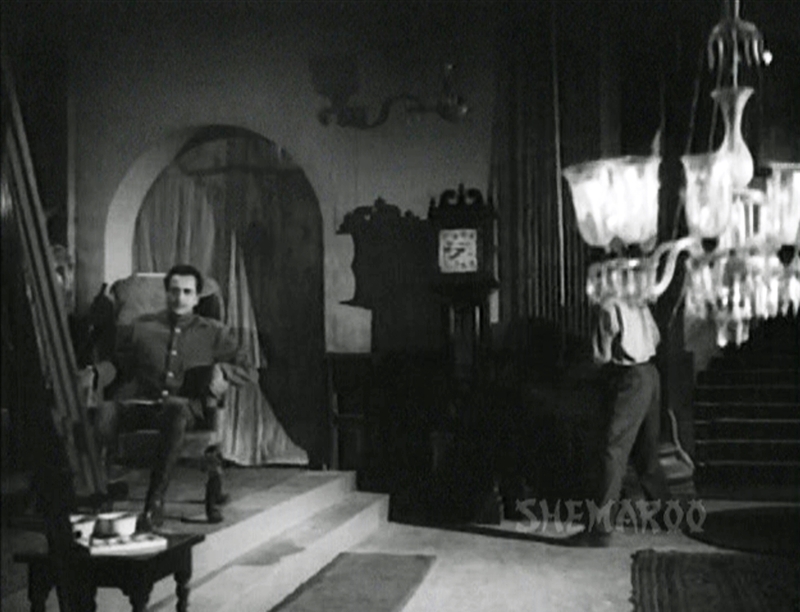 When he begins getting flashes of his past life, you see a curtain flying in the room where his standing, now take a look at the right had corner of the screen cap below, you will see the flying curtain. I quite liked that touch. 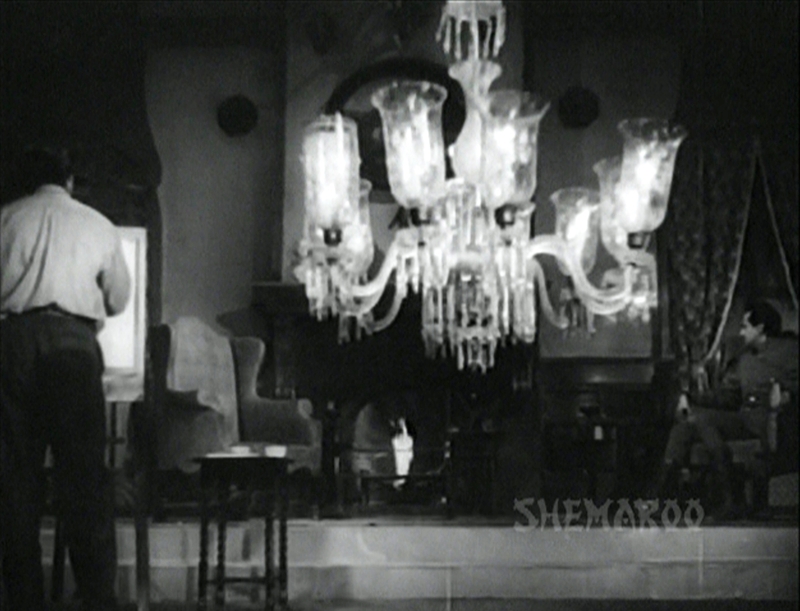 Throughout the film, Roy made effective use of the chandelier to create an impact and in this scene you see the chandelier and alongside you see a rather handsome looking Pran emerging. As for the background music, well you have to just hear it. and then there is the background music- well, no- I think the correct term would be, background sound. 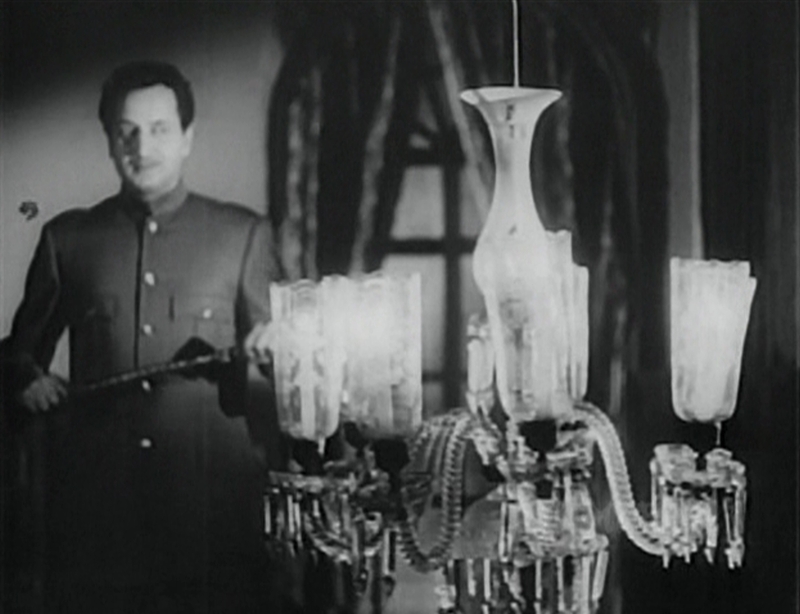 Note the sound of the storm, the payal (anklet) and the clink,clink of the chandelier. I will continue the Madhumati story, this time focusing on the comedy scenes and of course some trivia. What a lot of information I picked up by reading this, Shilpi. I love this 'behind the scenes' information contained in this post. Thanks Ava, I love to see all of you react so positively to my posts. Thanks once again. Shilpi, this was absolutely worth waiting for! Like Ava, I cannot wait for Part 2. Anu, every time I finish a post I will not deny that I wonder whether my approach to the subject will appeal to my readers or not but once I read the comments I feel so happy, thanks Anu. Shilpi, what I look forward to in your posts is the little personal details you give us, the background to the movies that we have all watched and loved, and the sort of stories that only someone connected with the film would know. It makes for such interesting reading, you have no idea how impatiently I look for your next post. :) I love films, and all the minutieae connected with the actors, the technicians and the films themselves. It is absolutely wonderful! So please, don't have any doubts whether it is appealing to us or not. I can assure you that it is all very, very interesting. 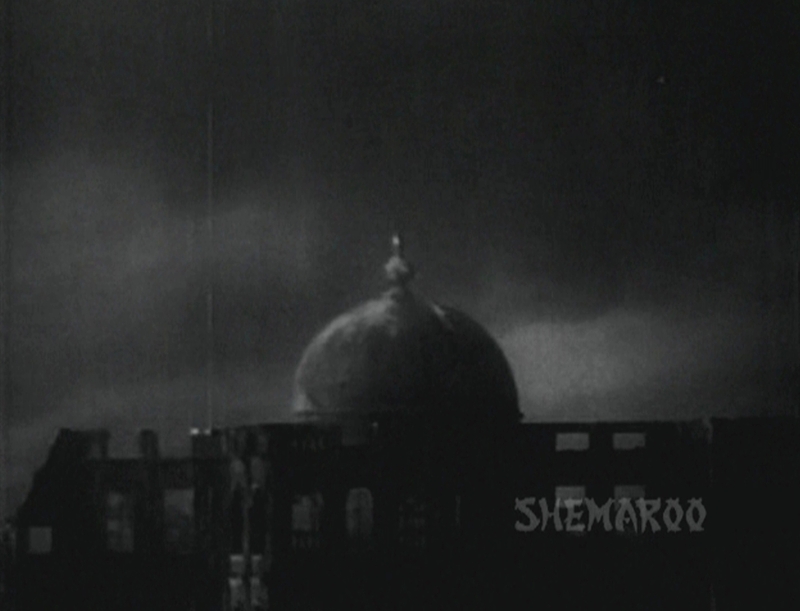 Like all other films covered in this series, the review of Madhumati also has opens the same feeling of expecting what next that the original film's opening sequences generate. Glad to see that all of you are eagerly waiting for the next installment. I often wonder whether all this is of interest to all of you and maybe I shouldn't go into such detail but once I get this reaction I know I can just go ahead and put down everything I know. Lovely article, Shilpi! Simply wonderful! I didn't know that Madhumati was six years in making. I think the major part of the six years must have been pre-production, isn't it? Also interesting to know that the first scene of Madhumati was filmed last! You are right about Salil Choudhary. I also had thought about that often! Thanks Harvey and no Harvey, it was not all pre-production the entire process of making the film took six years, there were some constraints that led to the delay. Hope you enjoy part 2 as well, will begin working on it soon. Like Harvey, I too didn't know that Madhumati took 6 years to make, Shilpi! Thank you for that bit of information, and for this great post. I really love the interesting little insights you offer into film-making (besides your anecdotes, of course). In particular, one thing that struck me about this post was your comment about the use of silence. I was watching a new Hindi film (new, as in, from 2006), just last week. Besides the fact that it was a badly made film, most of the dialogues between the lead pair were half-drowned out by very loud whistling and background music. I kept getting irritated and wishing the director had had the sense to use silence now and then! 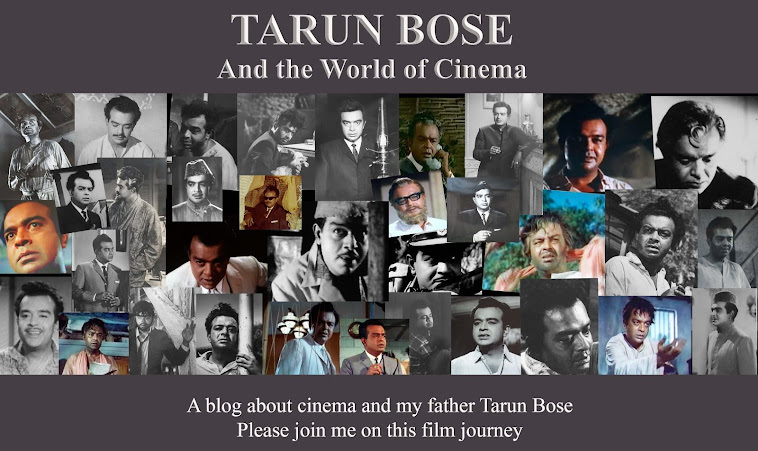 Thanks Madhu.The lack of silence in films has been irritating me for quite a while now. Whenever we see an old film be it Indian or an English language film, the excellent use of silence is striking. Yes you are right, dialogues often get drowned out by the blaring sound. Shilpi , you are right wonder what happened the comments have disappeared any which way wanted to let you know that am very impressed with the way you let us all know about the minutest details which like i said earlier we would have missed.Loved n enjoyed reading and waiting for the next. I love the way you have pointed out the director's effective use of silence and minimal music to convey the effects, as well as the effect of the curtain and the chandelier. Looking forward to the next installment It makes me want to watch the movie all over again. Thanks, Shilpi!. Thanks Lalitha, glad you enjoyed it. Perfect. What a nice way of looking at various scenes. I am really glad pacifist that you like what I write, that is undoubtedly a huge reward for any writer. Thank you. Thanks for this information. I had a vague idea that it was somewhere in Uttarakhand. Recently, Bimal Roy's daughter wrote a book about Madhumati where she has given detailed information about the film's location.